A higher-than-expected percentage of women and younger residents in southern Nevada are dying from malignant mesothelioma, sparking concerns that naturally occurring asbestos exposure has become a potential threat. A group of scientists and researchers from Nevada, Hawaii and Pennsylvania analyzed governmental statistics, as well as soil, rock and air samples, and concluded the surrounding environment in Clark and Nye counties is triggering mesothelioma in some of its residents. The Journal of Thoracic Oncology recently published the results of the study. State officials challenged the conclusions. Las Vegas, the most populous city in Nevada and a worldwide resort destination, is the county seat of Clark County. News of possible asbestos exposure to locals and visitors could negatively impact tourism. Baumann’s team of researchers included Dr. Michele Carbone, renowned mesothelioma expert and former director of the University of Hawaii Cancer Center. Until the last 15 years, mesothelioma was thought to be caused almost exclusively by occupational exposure to asbestos in various industries, including construction, manufacturing and ship building. Scientists in recent years have unveiled the environmental link, particularly from large, non-industrial asbestos deposits of actinolite and erionite throughout the Southwest, particularly in Nevada. 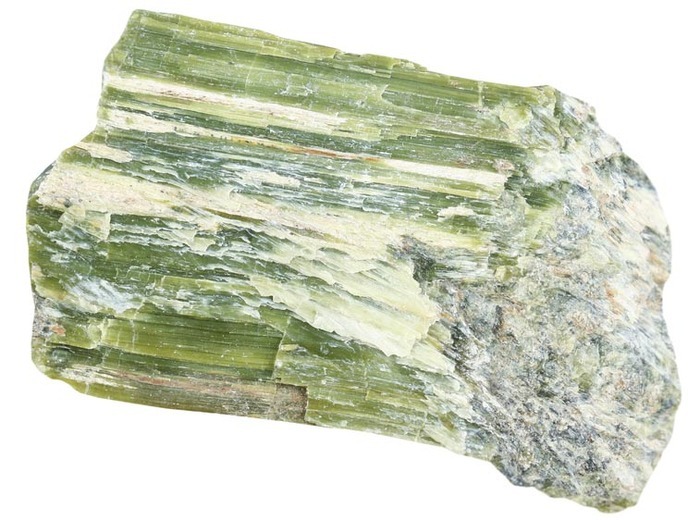 Actinolite (above) is a type of asbestos. Loose fibers from the mineral can become lodged in the lungs if inhaled and may lead to the development of mesothelioma. When those deposits are disturbed, through construction of roads, commercial development, or just natural erosion combined with dry conditions and high winds, they become airborne and dangerous if inhaled. The microscopic fibers are similar to those in industrial asbestos products. Researchers compared the rates of mesothelioma throughout the U.S. and other parts of Nevada to those in southern Nevada, where they found disturbingly high percentages of the disease among women and those under 55, demographic groups normally not associated with industrial-asbestos disease. U.S. Centers for Disease Control and Prevention data from 1999 to 2010 analyzed by gender, age group and county showed 31,526 deaths from malignant mesothelioma. Those under 55 years old accounted for 11.28 percent of mesothelioma deaths in Clark and Nye counties, compared to 6.21 percent of mesothelioma deaths in the U.S. and 9.09 percent in the state of Nevada. The male to female ratio of mesothelioma deaths in Clark and Nye counties is 2.69 to 1, compared to almost 5 to 1 in the U.S. and a little more than 6 to 1 in Nevada. Nevada has an age-standardized incidence rate of 10 mesothelioma cases per 1 million residents, considered average in the U.S., but unexpectedly high for a state with little occupational exposure. The higher rates of death from mesothelioma for female residents and younger residents are a clear sign of environmental exposure, according to the study. There is a lengthy latency period (20-60 years) between asbestos exposure and mesothelioma diagnosis, which explains the average age of death at 74 years. Mesothelioma often is discovered after many years of on-the-job exposure. Exposure at a younger age in southern Nevada could be explained by early, environmental exposure. Because the overwhelming majority of industrial exposure in this country has been in male-dominated occupations, the higher rate of female deaths also is a sign of environmental exposure. The presence of naturally occurring asbestos already has impacted industry in the state. An earlier analysis by geologists Brenda Buck and Rodney Metcalf at the University of Nevada Las Vegas, who also were part of the most recent study, detailed a region of the state filled with asbestos clusters. It prompted the Nevada Department of Transportation to impose a seven-month delay in the construction of the Boulder City Bypass, a major highway project through an asbestos-laden area. After a lengthy DOT analysis, construction kicked off, but with extra precautions to protect those working in the area, along with regular air monitoring. State health officials also have tried to downplay any risk to residents from asbestos fibers in southern Nevada, telling radio station KNPR the sample size in the study was too small to draw any firm conclusions. Baumann said the rarity of mesothelioma — diagnosed in 3,000 Americans annually — makes it difficult to separate environmental from occupational exposure, but cautioned the results should not be ignored. Health officials also told the state’s public radio that it sent a cease-and-desist order to the University of Hawaii that blocked presentation of the study at a scientific conference last year, forcing Baumann to use only data from the CDC, and not from the Nevada cancer registry.